Isn't it beautiful? The sentiment is a quote from Thomas B. Macaulay that roughly translates to: "Many people enter and leave in your life, but only true friends leave footprints in your heart." 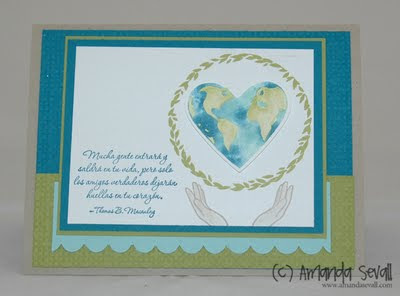 I'll be back tomorrow to show you how I made my own inkpad to create the two-toned water on the heart globe! Very curious to hear how you did the water. Did you put ink onto acetate and then apply it with a paintbrush? Hmm.. must wait until tomorrow, I guess!